Varian loves talking to kids, teens and adults about reading and writing, and about his passion for children’s and young adult literature. 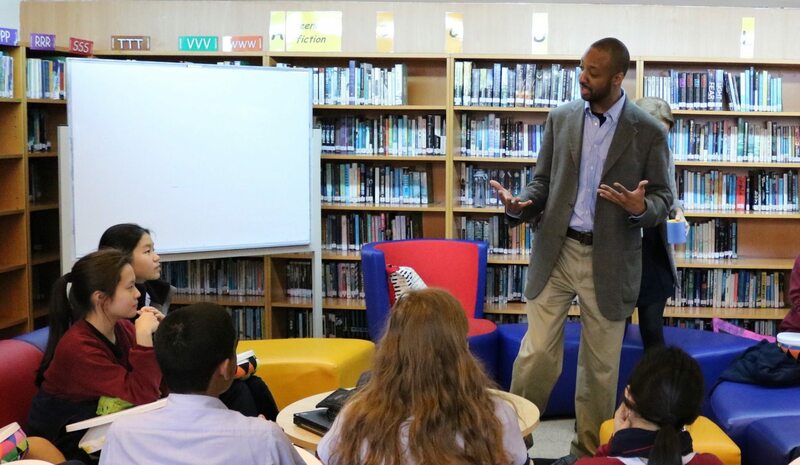 He is available for school and library visits, workshops, panels, and keynote addresses, with each presentation tailored to fit the needs of the audience. If you are interested in booking Varian for an event, please contact him for programming, rates and availability. Varian’s typical full-day visit includes up to three (3) 45-to-60 minute presentations per day, along with lunch with a small group of students if the school would like to organize it. (Depending on the schedule, Varian may be able to schedule a forth visit per day.) He is happy to share visits between schools. Varian’s school presentations are best suited for upper-elementary through high school. Much of Varian’s presentation centers on his life as an engineer and an author. He also teaches writing workshops for all ages (including adults and other writers). Varian is happy to develop keynote addresses for any audience. He has recently given keynote speeches at the 2015 National SCBWI Conference, Spalding University MFA residency, and 2016 Texas Council of Teachers of English Language Arts Conference. If you have any questions concerning his rates and workshop presentations, please ask. Depending on Varian’s schedule, some fees are negotiable. Varian has found that the most rewarding school visits are those in which the students are familiar with his work. He highly suggests that teachers and librarians make copies of his novels or short stories available to students prior to the presentation. All materials © 2019 Varian Johnson. All rights reserved. Website by Websy Daisy.